Earn $57.75 in VIP credit (5775 points)What's This? The Zipp Vuka Aero Aerobar redefines the conventions of aero handlebars, while being compatible with modern-day aero bikes. 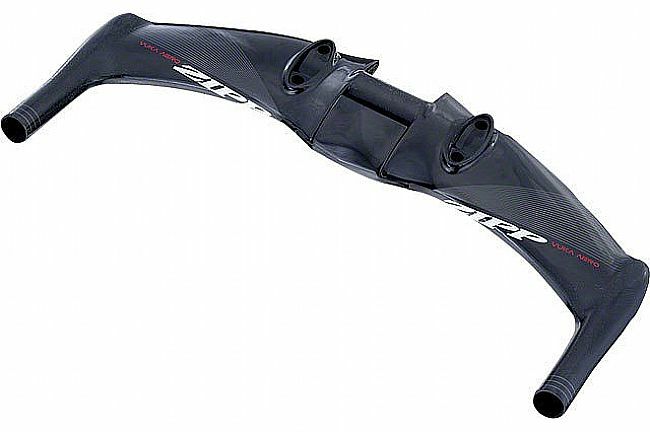 Building on the technological foundation of aero excellence set by Zipp's original, this integrated aero bar can be used with any stem to provide the ideal on-the-bike position. Based on the shape of their SL-70 Aero handlebar, this bar is stiff and streamlined while maintaining the UCI's 3:1 aspect ratio requirement. Featuring a removable center cap, this ingenious design element adds 5% stiffness to the aero bar, integrating seamlessly with the airfoil. Constructed with the same Exogram™ technology used in the ultra light, ultra strong SRAM® RED cranks. This aero basebar allows for customizable setups, and with their Vuka Fit software, apply fit coordinates to the Vuka Aero simply and easily. Claimed weight: 700g (w/ carbon extensions). Gloss finish. Matte finish available here. The Zipp Vuka Aero Integrated Aerobar does not include extensions. Aluminum extensions and carbon extensions are available separately.